soniccatch is an ultrasonic trap for small particles to be measured in-line in industry. 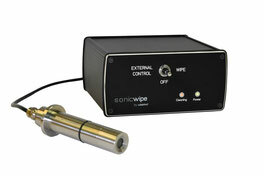 sonicwipe is a powerful means to take care of the cleanness of in-line sensors. sonicamp delivers a well-controlled driving signal in coordination with process control. We offer add-ons in the regime of PAT (Process Analytical Technology). Our expertise is to exploit well-controlled ultrasonic fields for the agglomeration of small particles in dispersion. Our devices allow for the improvement of in-line measurements in various industries to gain real-time accurate data from within the process. For further information on the usePAT technology click on the download section in whitepapers & more. Industry magazine PROCESS published an article on usePAT´s technology. usePAT won the award "start-up star" in November 2018 at the mercur prize ceremony of "Wirtschaftskammer Wien"! This price honors us and gives us a great possibility of an exellent network. Managing director Dr. Stefan Radel presents the applications: soniccatch, sonicwipe & sonicamp. Please follow the link to see the whole webinar! The austrian center of industrial biotechnology invited usePAT to contribute a blog article on inline sensing in industry 4.0! usePAT consists of a multi-discipline team. All members are experienced and technically-skilled experts in the fields of ultrasonic & technology development as well as mechanical engineering, chemical analytic, electronics and process engeneering as well business development & management. Our knowledge at your service.